Welcome to Ndlovu Lodge. 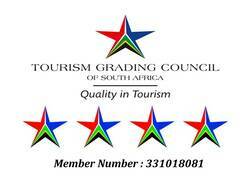 We trust that our hard work and dedication will make your stay memorable at our 14 rooms, 4* Lodge. If you are trying to find where to stay for a bushveld holiday conveniently placed in Pretoria, then your search is at an end. Situated in Pretoria East, close to entertainment and business area for the comfort of our clients. Please contact us and speak to one of our friendly staff to arrange your booking. Our lodge’s unique placement in the South African capital of Pretoria makes us a gem to be discovered by those who are seeking the tranquility of nature close to home. It is not necessary to drive for miles and miles to find a hotel and restaurant in Pretoria’s peaceful surroundings of nature. Ndlovu Lodge embodies the feel of the bushveld, situated in the Zwavelpoort Area of Pretoria East, our hotel is the perfect example of an African bush escape, with none of the hassle of traveling far out of town. You can have a wonderful and quick get away without ever leaving the city! We are easily accessible from the N1 and N4 highways and only a 35-minute drive from OR Tambo International Airport, which makes us the perfect choice of accommodation for international visitors looking for a high-end lodge in Pretoria. The six-hectare property is covered with vegetation indigenous to the Zwavelpoort area of Pretoria East The perfectly chosen landscaping allows our guests to enjoy a splendid view of the well-organized and sustainable garden. The African architecture of the lodge, which is inspired by old African safari camps, blends beautifully into the lodge’s carefully maintained natural surroundings. Our restaurant, known as Resturante El Encuentro, presents a sublime fusion of Spanish, Mediterranean and African cuisine, which perfectly suits the atmosphere and ambience of the lodge. Our personal understanding of Africa has been reflected in the unique decoration and atmosphere. Natural wood, a comfortably warm welcome around the fire, a classy ambiance and all the modern amenities offer our guests Ndlovu Lodge’s special brand of hospitality. The hotel has a timeless structure. Whether you are a local from Pretoria looking for a convenient getaway in Zwavelpoort just next door, or an international traveler looking for accommodation in Pretoria, the natural beauty of Ndlovu lodge has exactly what you need.